1 of 2 Cook beef, onion and pepper in large skillet over high heat, breaking up meat with wooden spoon, until meat is no longer pink, 5 minutes. Drain fat from skillet. 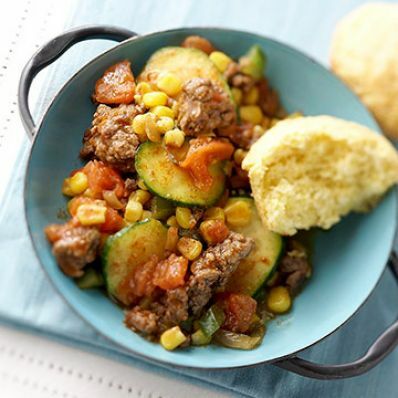 2 of 2 Add zucchini, tomato, corn, chili powder, salt, pepper and garlic powder to skillet. Cover; simmer until vegetables are tender, 15 minutes.